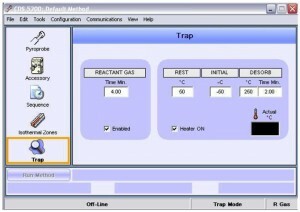 The Autospec GCMS system in the Summons lab is connected to a CDS 5250T Pyroprobe. 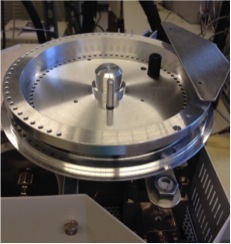 Equipped with a carousel autosampler and a cryotrap, this powerful instrument expands the diversity of samples that can by studied by GC-MS and allows for a variety of different analyses to be carried out. Reactant gas pyrolysis with trapping, in which the hydrocarbon trap is flushed with a gaseous reagent to react with the pyrolysis products as they are trapped. 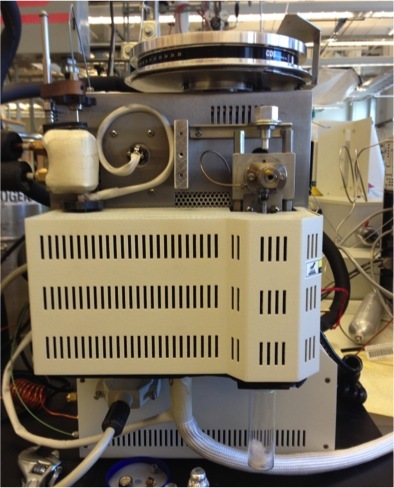 Though there are many advantages to using this system, there are also some disadvantages: sample sizes are limited to around 20mg (although the pyrolysis products of multiple samples can be collected in the trap and released to the GC-MS together to expand this upper limit). Also, pyrolysis can cause aromatization of compounds. The complex chemistry in the oven can furthermore yield compounds resulting from high-temperature reactions among pyrolysis products. 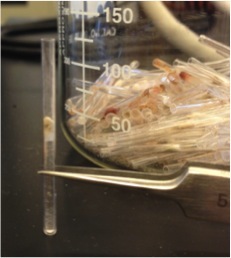 Samples are introduced in a narrow quartz tube, supported by a quartz filler rod within the tube and sandwiched between plugs of quartz wool. Many such samples can be loaded onto the autosampler carousel, which drops these tubes into the pyrolysis chamber one by one, allowing for unattended collection of large datasets. The pyroprobe communicates with the GC-MS system to trigger the start of analysis at the correct time. The picture below shows the path taken by the sample tube (a view usually obscured by a protective cover plate): the tube drops down from the autosampler above (the curved object visible in the top of the expanded view on the left) to the inlet valve, which controls the release of the tube into the pyrolysis chamber. The chamber is heated by a platinum filament (which ought to be checked periodically to ensure that its coils are evenly spaced and not touching one another—a condition that could cause uneven heating and/or damage). 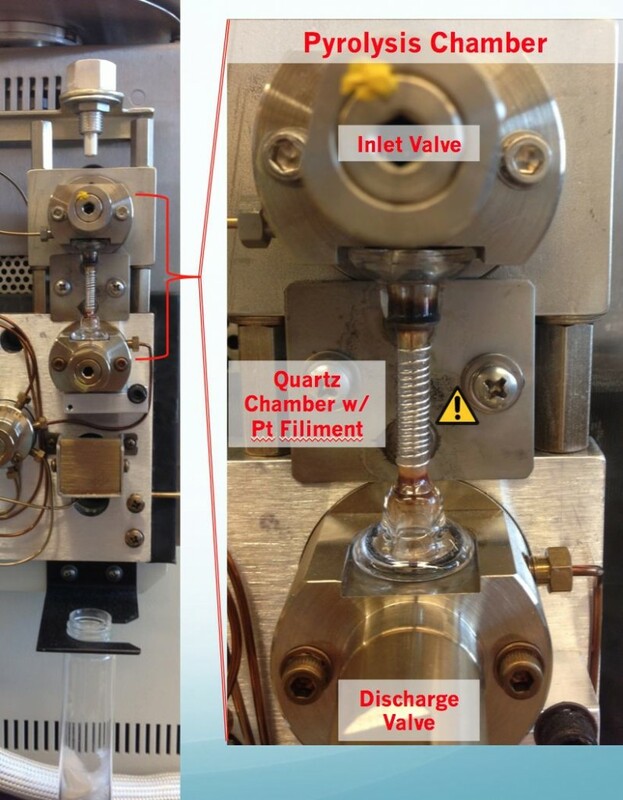 The tube visible at the bottom right carriers the pyrolysis products out of the pyrolysis chamber and onwards toward the GC-MS. Once pyrolysis is complete, the discharge valve drops the sample tube into the tube below (bottom of the left picture). 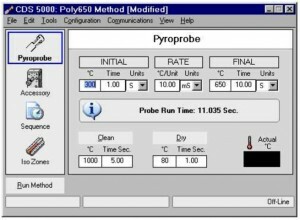 The software allows almost every parameter of the pyrolysis to be programmed for each sample—durations, rates, and temperatures. Here is another view of the pyroprobe (with the cover off) showing—schematically—the possible paths through the instrument depending on whether the pyrolysis products are carried directly to the GC (green path) or first trapped in the hydrocarbon trap (yellow path; the trap is the white box in the top left of the instrument, and is cooled with liquid nitrogen). 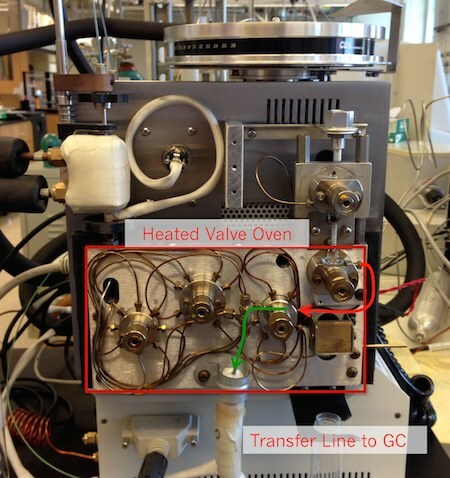 Regardless of the path chosen through the pyroprobe, the pyrolysis products are then transported to the GC in the carrier gas through a heated transfer line (the temperature of which can also be chosen). This transfer line is connected to the Agilent 6890 GC via the split/splitless inlet and allows the full analytical capabilities of the AutoSpec system to be brought down upon the sample—including full scan, SIM, and MRM modes. You can read more about the AutoSpec here.